On Earth, polycyclic aromatic hydrocarbons, or PAHs, are best known as carcinogens and environmental pollutants, produced as byproducts of fuel burning. 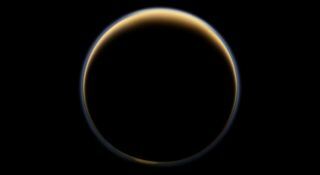 It turns out these complex hydrocarbons are also contributing to the thick orange-brown smog that cloaks Saturn's largest moon, Titan, researchers say. With a diameter of 3,200 miles (5,150 kilometers), Titan is the second-largest moon in the solar system. It's also the only one with clouds and a dense, Earth-like atmosphere and the only known place in our solar system besides Earth to have stable liquids on its surface. The huge amount of methane makes the haze on Titan "like L.A. smog on steroids," explained Scott Edgington, Cassini deputy project scientist based at NASA's Jet Propulsion Laboratory in Pasadena, Calif.
Two new studies using data from Cassini's visual and infrared mapping spectrometer (VIMS) show how those simpler molecules form heavy, complex hydrocarbon molecules that make up Titan's smog, Edgington said in a statement. Titan's nitrogen and methane molecules are broken up in the moon's upper atmosphere, about 600 miles (1,000 kilometers) above the surface, by sunlight and particles from Saturn's magnetic bubble. The positive ions and electrons that are left over trigger a chain of chemical reactions, resulting in hydrocarbons — including PAHs, which are large carbon-based molecules that form from the accumulation of smaller hydrocarbons, researchers say. PAHs can keep building up, aggregating to form bigger, heavier molecules that sink lower into Titan's atmosphere, eventually leading to the aerosols embedded in the dirty haze that cloaks Titan, closer to its surface, below 300 miles (500 kilometers) altitude. Scientists, who reported their findings in the Astrophysical Journal, confirmed the presence of PAHs in Titan's upper atmosphere using VIMS. "We can finally confirm that PAHs play a major role in the production of Titan's lower haze, and that the chemical reactions leading to the formation of the haze start high up in the atmosphere," study researcher Manuel López-Puertas from the Astrophysics Institute of Andalucia in Granada, Spain, said in a statement. "This finding is surprising: We had long suspected that PAHs and aerosols were linked in Titan's atmosphere, but didn't expect we could prove this with current instruments." Another group of scientists, led by Bianca Maria Dinelli from the Institute of Atmospheric Sciences and Climate in Bologna, Italy, was studying the infrared emission from various molecules in Titan's atmosphere when they noticed an irregular signal. "The central wavelength of this signal, about 3.28 microns, is typical for aromatic compounds — hydrocarbon molecules in which the carbon atoms are bound in ring-like structures," Dinelli said in a statement. After ruling out other simpler compounds like benzene (an aromatic compound with just one ring), the researchers say they found that the signal was the result of a mixture of many different PAHs, which contain an average of 34 carbon atoms and about 10 rings each. "PAHs are very efficient in absorbing ultraviolet radiation from the sun, redistributing the energy within the molecule and finally emitting it at infrared wavelengths," explained researcher Alberto Adriani from the Institute for Space Astrophysics and Planetology at Italy's National Institute for Astrophysics in Rome. The results were detailed in the journal Geophysical Research Letters.